Network Password Decryptor Portable instantly recovers network authentication passwords stored on your system. Available as a command-line utility as well. In addition to the network authentication passwords, it can also recover passwords stored by other windows apps such as Outlook, Windows Live Messenger, Remote Destktop etc. These network passwords are stored in encrypted format and even administrator cannot view these passwords. Also some type of passwords cannot be decrypted even by administrators as they require special privileges. Network Password Decryptor Portable automatically detect and decrypt all these stored network passwords. 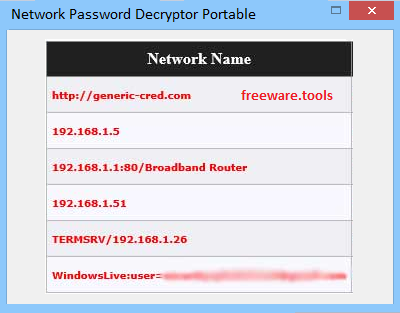 Network Password Decryptor Portable is a utility which can help individuals recover network passwords saved in the Credential Store area of Windows. This is the portable version of Network Password Decryptor, meaning it does not require installation. Consequently, you can copy the program files to any location on the hard disk, in order to easily run the app from there, by simply clicking on the executable. In addition to that, it is possible to use it on any computer you have access to, by dropping the last mentioned files to a portable storage unit, such as a USB flash drive. It is also important to keep in mind that the Windows registry and Start menu/screen are not going to get updated with new entries. The interface is straightforward, displaying all the options available and enabling any type of person to make use of this software tool, regardless of their previous experience with computers. All you need to do in order to begin the retrieval process is press the “Start Recovery” button. In a matter of seconds, Network Password Decryptor Portable is going to show you all the detected passwords in a list, along with details such as network name, type, username, password and last modified date. Passwords can be saved to the Clipboard, or you can simply export the entire list to a custom location on the hard drive, in an XML, HTML or TXT format. To sum up, Network Password Decryptor Portable is a tool which can come in handy when trying to retrieve forgotten passkeys. It does not put a strain on your computer's performance, as the CPU and memory usage is minimal, and response time is good.